Former college basketball official and Major League Baseball player and coach receive awards at luncheon at Randi’s. 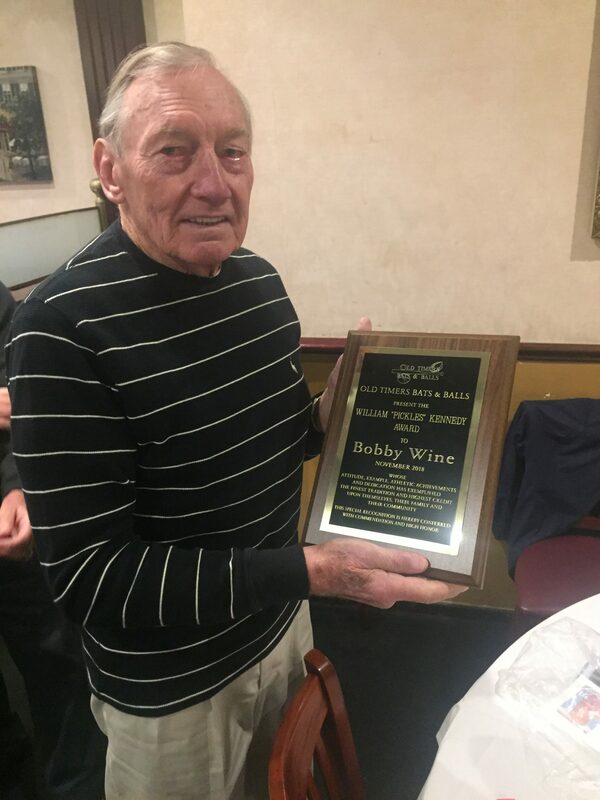 The Oldtimers Bats and Balls Association last week honored two people during its meeting at Randi’s Restaurant & Bar, 1619 Grant Ave. in Grant Plaza II in Bustleton. 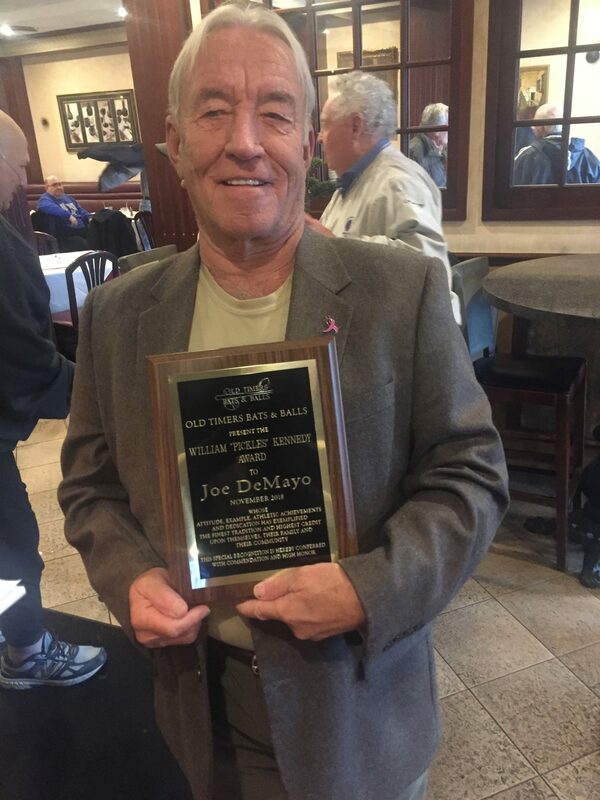 Receiving the William “Pickles” Kennedy Award were Joe DeMayo and Bobby Wine. DeMayo grew up at 4403 Bleigh Ave. and played a lot of basketball in the Forrest Elementary School yard. He graduated from St. Bernard Elementary School and played football and baseball at Father Judge High School. He was a college basketball official who called some NCAA tournament games. Among the games he reffed was Valparaiso’s famous 3-point buzzer-beater to upset Mississippi in the first round of the 1998 tournament. Wine, a shortstop, played for the Phillies in 1960 and from 1962-68 and for the expansion Montreal Expos from 1969-72. He won a Gold Glove in 1963. He was on the 1964 Phillies team highlighted by Jim Bunning’s perfect game and Johnny Callison’s game-winning home run in the All-Star Game. 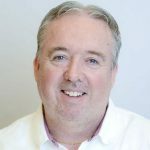 The team lost 10 games in a row at the end of September to allow the St. Louis Cardinals to win the National League and, eventually, the World Series. “We blew it,” Wine said. Wine was a coach for the Phillies from 1972-83, winning the World Series in 1980. He also coached the Atlanta Braves in 1985 and ‘89-90 and the New York Mets from 1993-96. He was also interim manager of the Braves in 1985. The Pickles Kennedy Award is named in memory of a former star basketball player at Abraham Lincoln and Temple. Kennedy spent a year with the NBA’s Philadelphia Warriors, then played minor league baseball for several years in the Pirates organization. Among those attending the luncheon were Bobby Shantz, a former American League Most Valuable Player; Joe Scarpati, a former pro football player best known as the holder for Tom Dempsey’s then-NFL-record 63-yard field goal in 1970; former Phillies outfielder Doug Clemens; and Sean Landeta, who punted for the Philadelphia Eagles and Philadelphia Stars. The Phillie Phanatic entertained the crowd. The Oldtimers group consists of former athletes and officials. Members meet four times a year at Randi’s. Lunch costs $11.